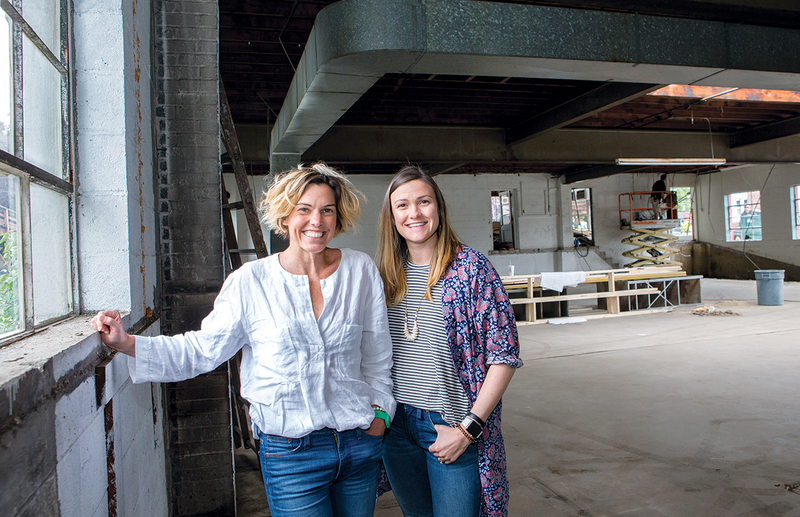 The women behind E. Frances Paper Inc. are preparing to move into their own place this summer, a renovated former auto dealership and garage that will include room for storing inventory. Featuring high-quality paper, and quirky, hand-painted forms – think a seagull with a sweater or a vintage Volkswagen bus – the stationery and greeting card company created by the three partners in 2013 has taken off quickly. None of this was what sisters Jenni Laundon and Ali Flippin, and cousin Emily Roberts, thought was going to happen when they started their business. It all started in a small office in Flippin’s house, then advanced to a kitchen, a spare bedroom and eventually a self-storage unit. “We actually went to work every day in a storage unit,” Laundon said, complete with a flickering light and no windows. But more recently, they’ve had a leased office in Newport, soon to be replaced by their own place. In July, they will move into a 4,000-square-foot portion of a newly renovated building that they purchased in Middletown, on Main Road. Laundon, who is the sales director, said the artwork of her sister, Flippin, has driven the sales. Almost all their work now is sold wholesale, and then to consumers through 600 retail stores in the U.S. They also have distribution in Canada and Australia. The Little Notes, a set of 85 small cards without envelopes, have proven to be a customer favorite. With the slogan “Use Unsparingly,” they’re helpful in lunch boxes, in suitcases, on refrigerator doors and mirrors. The business has sold 5 million of the Little Notes boxes so far. From the start, E. Frances Paper took off almost immediately. The company named for the partners’ grandmothers debuted at a national stationery show, where a national group was impressed and took them on, Laundon said. They only recently launched a website, which offers direct sale to consumers. In a competitive industry, what has made them stand out? Laundon credits her sister’s artwork. Everything she creates is hand-painted, then reproduced. The team then spends a lot of time deciding on what words to use to convey the meaning of each item. The words are used sparingly, carefully. Attention to design and detail, and then manufacture on a quality paper stock – 110-pound felt watercolor paper – has worked to create a success story. CORRECTION: The story has been updated to reflect accurate sales statistics for the Little Notes product, and to correct the size of the new building.